‘The Féileacán Flies’ was a major collaborative research project aiming to bring together young people with disabilities to write, devise and perform together in real space and across time and distance. 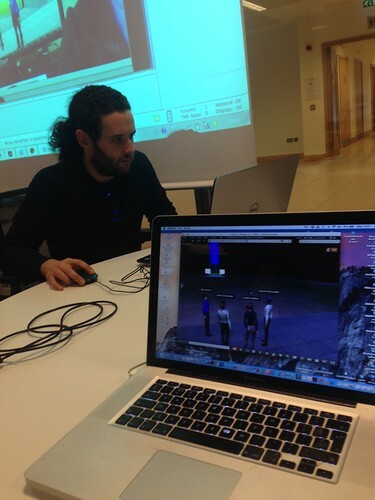 SMARTlab worked on-site in Dublin, Innes and Limerick in retreats and workshops with young people, their teachers, families and helpers, along with dancers, musicians and biofeedback engineers. Together we created a plan to enable these young people to tell their own story and make their own public show. Working for nine months with international collaborators and four groups of young people from across Ireland, we investigated and co-created a story that could be told in dance and movement, and staged an integrated live and mediated performance produced by SMARTlab and the SPIRITlevel consortium in the summer and autumn of 2003, as part of the European Year of People with Disabilities. The project was a major collaboration with Media Lab Europe’s MindGames Research Group + the NY CATlab, Fluxus, Counterbalance and the Central Remedial Clinic, Dublin. The nine-month research and devising process led to a final show involving sixteen young people with disabilities across Ireland in real-time telematic linked performances, with Fluxusdance and Counterbalance (dance/community project funded by Arts and Disability Ireland). 2 September 2003 : The Féileacán Flew in Dublin! The Story: The Féileacán Flies . . . The young people of this world are fed up. They don’t want to deal with prejudice and poverty; they want to find a better place where everyone has an equal chance. Their frustration shatters this world – but there is no better place in sight: they have to find a new world, and first they have to build a ship to take them there. The ship evolves the wings of a butterfly! The journey begins. The children are guided by an Angel, encounter an alien, find that there is some prejudice everywhere (even within themselves) and then decide to leave all that behind and make a better way. They erase the clouds of prejudice, breathe new life into a new space, and then find when they land that there are friends out there: moving in tandem, breathing and giving life to new angels, new forms of hope and trust. When they let go of the fear of flying, the Féileacán reveals itself (the great butterfly spirit of rebirth) flies on to new spaces, and new Féileacán are let loose on the skies. Dance with the Féileacán! FLY! The Féileacán Flies . . . Devised in workshop with the children of CRC Dublin, St Gabriel’s Limerick, St Clare’s Ennis, and Scoil Mochua, Dublin and the company. – at Media Lab Europe – Louise Graham, Joanne Cahill, David Loughane and Colm Cosgrove, Sean McGovern, Michelle Rooney, Fragha Veighy, Carol Rowland and Eric the master alien!!! Colm O Snodaigh and Kíla | Gary McDarby, MindGames Group, Media Lab Europe | Ger Craddock , Brian Boyle, Kieran O’Callaghan and Patricia McCrossan,CRC | Paul Spencer | Martin Pegman and Martin Lynch, Media Lab Europe | The Samuel Beckett Theatre at Trinity College | Roslyn Park Rehabilitation Centre | Justine Doswell | Stephen Regan | James Brosnan & the families and helpers of all the Féileacáns!